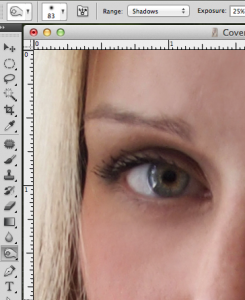 I know sometimes Photoshop and color correction in general can seem like magic. There’s even a magic wand in the software! And while it might take years to become an expert with the software, it doesn’t take long to learn a few simple tricks that can really enhance your photos and make you feel like an expert, even if you aren’t one. 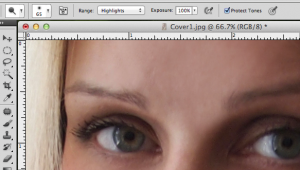 Next, check the settings which, if you left Photoshop with the default set up, will be along the top of the image. An important thing to know about the Dodge tool is it lightens anything you paint with it. If you’re lightening something, chances are you want to affect the midtones and the highlights…those lovely catch lights in her eyes which in the original look a bit washed out. Make sure the Range is set to Highlights or Midtones, the Exposure as heavy as you like (think of it as how hard are you going to push on that paintbrush, with 100% being very very hard, and 0% being you never took the brush out of the drawer), take a deep breath, and paint on her eyeball (if your brush size is too big, right-click and you’ll get a menu that lets you change the size of the brush. Keep it just big enough to do the job, or maybe a tad smaller). You’ll notice things getting lighter. Is it too much? Hit “undo”, then change the exposure until you are happy with the results. Next, change the Range to Midtones and paint some more. I did a pass with both until I had a nice, bright eye. 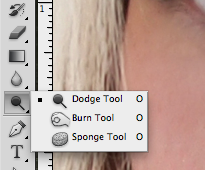 Next, select the Burn tool, which is located under the same menu as the Dodge (see above image, it looks like a hand). When you are Burning something, you’re making it darker, as the name implies. It will only act on the range of tones you select, however. Therefore, if we set the Range to Shadows, it only makes the darker tones darker, leaving the highlights and midtones alone. Go ahead, and paint over that eyeball again with the Burn tool. You’ll probably find that you need to set the Range fairly low. For this image, I used 10%. I was also selective on where I painted, and used a very small paint brush so that I only darkened exactly the areas that need it, like the pupil and the aura of the eye (the dark ring around the edge). These two tools leave you with brighter highlights, darker shadows, and a full range of tones that, when combined on something like the eyeball, result in a dimensional, bright, shiny eye!